The opening weekend of February is set to be an exciting one at Roscommon Arts Centre, when the much anticipated Swan Lake takes to the stage. Billed as “theatre with magic in its veins” by The Evening Standard, this is a show that has been on the centre’s wish list since it first won the hearts of audiences at the 2016 Dublin Theatre Festival. Set close to home in the midlands of rural Ireland, and combining storytelling, theatre, dance and live Irish folk music with a Nordic twist from the band Slow Moving Clouds, a total of 13 performers from all around the world will bowl audiences over with their mesmerising performances. 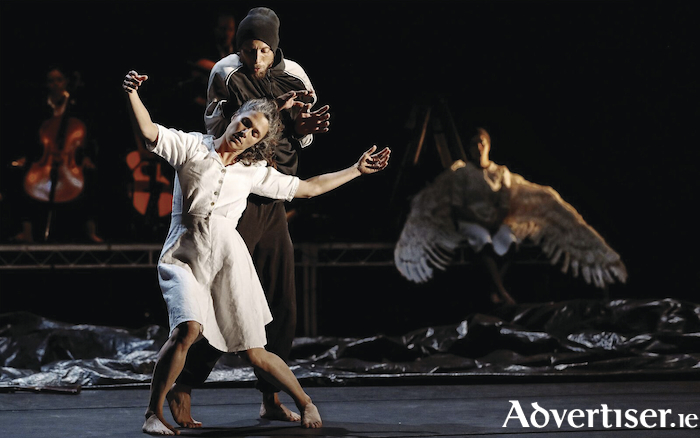 Swan Lake boasts a local connection, with its creator Michael Keegan Dolan hailing from County Longford. Widely considered one of Ireland’s foremost dance and theatre makers, this is Michael’s first production with his new company, Teac Damsa. This is an extra-ordinary rural adaptation of the classic story, where ancient mythology and the modern world collide. It is very much a Swan Lake for our time.